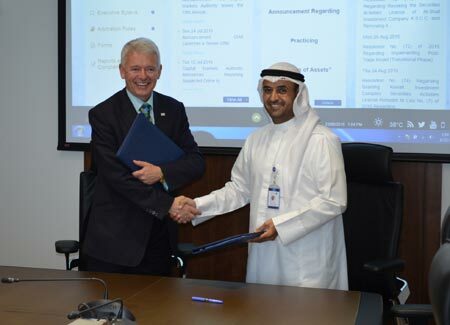 The Chartered Institute for Securities & Investment (CISI) has signed an agreement with Kuwait Capital Markets Authority (CMA), as part of the CMA’s strategic plan to develop the securities sector in the State of Kuwait, diversify its investment instruments and promote the CMA to the rank of its counterparts in the global markets. The agreement follows the memorandum of understanding between the CISI and the CMA which was signed earlier this year to determine the needs of the financial sector in the State of Kuwait. The agreement establishes an integrated programme to serve securities practitioners in the financial sector through the application of international qualification tests on specified positions for licensed persons. It aims to raise the efficiency of market participants, improve the CMA’s own laws and regulations’ tests, emphasise the CMA’s role in keeping up with best international practice and provide protection for practitioners in securities activities. This will help achieve the CMA’s vision as a leading regulatory body seeking to improve the capital markets in Kuwait and to create an attractive investment environment that builds investor confidence. “The Capital Markets Authority signing an agreement with the CISI is a significant step to improve the capital markets in Kuwait and is a sign of the industry’s awareness of the importance of integrity and ethics in finance. With this move, we will help Kuwait align with its counterpart global financial centres. Confirming benchmark levels of competency will ensure Kuwait can demonstrate its competitiveness and is aligned to international standards. Whilst this top level support from the CISI is essential, it’s equally as important to emphasise the benefit of continuing professional development (CPD).